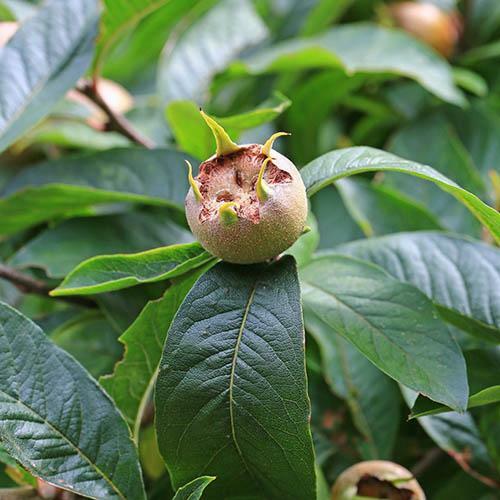 ‘Patio’ Medlar, introduced by the Romans, now centuries later, available in ‘Ultra-Compact Patio Form’ for you to grow! We've unearthed something really different for you here – usually the preserve of stately homes and seen as large, shapely trees, you can now have your own perfectly compact example BUT you will still pick a bumper crop or ‘Medlars’ each autumn. Possibly the perfect patio fruit tree for the smaller garden, it will form a perfect dome shape that will flower in spring and form unusual looking fruits that develop throughout the summer. Within a couple of seasons you should get 30 or so Medlars each autumn. The fruits will ripen once picked and become soft – the ripening process is referred to as ‘Bletting’. Once fully ripe in mid-late autumn, the soft, sweet flesh can be eaten as is or made in to a jelly preserve – it makes the perfect accompaniment to savoury dishes and goes brilliantly with cheese. It's breeder, renowned British fruit grower and ‘Grafter’ William Sibley, has been working on new and novel compact fruit trees for the British home gardener for decades, and claims that this is one of his best discoveries. Medlars have been somewhat overlooked in the rush to grow fruit in the home garden. Yet their most unusual looking fruit make great jellies, jams, and sauces, and they have the most beautiful pure-white spring blossom and attractive leathery green leaves in summer too. Hardy and self-fertile, it really is an easy winner. This naturally compact beauty has been grafted onto a very dwarfing Pear rootstock, so it will stay very manageable in size for many years. It will look fabulous in a pot on your patio or terrace, but will be equally at home planted in to your garden soil in a sunny spot too.